My wife, Liza, and I visited Bohol after a few days at the much more famous Philippine beach resort of Boracay. And while Boracay does have perfect white sand beaches, it draws large crowds of tourists and its beachfront has become very commercialized. The island of Bohol, a ferry ride from the bustling Philippine city of Cebu, was the "tropical paradise" we had expected Boracay to be. With perfect and uncrowded beaches, and palm trees not surrounded by vendors, Bohol is the perfect place to get away from the stress of modern living. We stayed at the Bohol Beach Club, a sprawling resort that seems to cater to medical conferences as a large part of their business. The doctors know where to go. We had a palatial beachfront villa, with traditional Filipino/Spanish décor. The first night we enjoyed a buffet dinner of Filipino cuisine (a delectable blend of Chinese, Spanish and Polynesian dishes), and a show of Filipino folk dances. On our second day we hired a local guide and cab for a tour of the island that included historic sites; a view of the rare Tarsier monkey (the world’s smallest); a riverboat ride with lunch; a visit to Bohol's famous "chocolate hills"; and food shopping. On our very interesting day-trip, it seemed like a new activity lurked around every corner. Our first stop was at the site of the historic “Blood Compact” between Spanish explorers and the native Filipinos, one that hearkened back to the “blood brothers” ceremony of the Native Americans. Unfortunately for the local people, the Spanish colonizers gave as much credence to the treaty as Custer’s cavalry gave to pacts with the Sioux. A huge bronze sculpture depicted the ceremony on the site of the treaty, a cautionary tale for indigenous peoples. Our next stop was at a small viewing site for the all-but-extinct Tarsiers, often called the world’s smallest monkeys. There is scientific disconnect about whether this small, bug-eyed, nocturnal primate is really a monkey at all, but the description is one that Bohol’s citizens are proud of. And care is taken at the exhibition area not to alarm these famous island residents, as flash photography or spooking the little guys in any way is strictly prohibited. Our next stop was a pleasant surprise, as we boarded one of the many floating restaurants that ply the Labac River. The cruise includes a buffet lunch of Philippine dishes like pancit (a noodle dish with chicken, pork or shrimp) and lumpia (Philippine eggrolls). All the time musicians entertain with Filipino standards. The boats stop at a pier where a children’s group energetically performs songs and traditional dances, and then the boats leisurely cruise to a waterfall and back, about ninety minutes in all. The jaunt captures the natural beauty of the Philippines while rolling along the river. 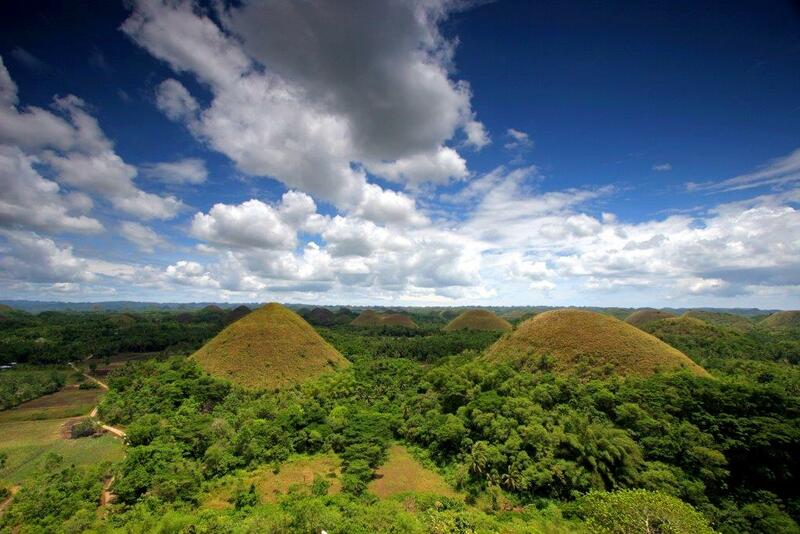 Next we paid a visit to Bohol’s most famous attraction, the “chocolate hills,” which do look like mounds of candies, scores of them, stretching to the horizon. Even if it was a long day, we just had to climb one these strange formations. The hills were, in fact, green when we visited in April, because they only turn brown when the grass is burned by the sun in the Philippine summer. They are a remarkable sight however, even if in the spring they looked more like green mint gumdrops than Hershey’s kisses. Our next stop was the historic Church of the Immaculate Conception, also known as Baclayon Church, a masterpiece of religious architecture from the days of the Spanish colonization. The impressive Baroque edifice was built in 1727, and was the seat of the Jesuit order in the Philippines. Lastly, we visited a Filipino grocery and purchased some delicious foods to enjoy back at the hotel while taking in our view of the magnificent beach. Our respite in Bohol was both relaxing and educational, and a nice change from the bustle of Manila, which has its own, though different, attractions. For more about the Philippines, go to www.tourism.gov.ph. Enjoy!